Chipo C. Nyambuya began her career as in-house legal counsel in the financial services sector with a focus on copyright, technology procurement and retail banking. She then transitioned to a career as an advisor for rule of law and governance projects in international development where she designed and taught organizational and operational frameworks for governmental institutions and non-governmental agencies. Ms. Nyambuya has nearly twenty years of cross-sectoral experience advising F500 corporations, start ups, international development agencies and foreign governments. Her expertise ranges from negotiating multi million dollar deals to helping establish legal and judicial institutions in post conflict countries. She continues to advise organizations and governments on policy and rule of law issues relative to energy, education, economic development and technology. In recent years she has consulted for start up companies on technology law and for not for profit organizations. 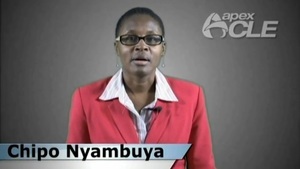 Ms. Nyambuya serves on the boards of Survivors’ Truths, 1919 at blue1647, Global Smart Kids, Institute for Work and the Economy, and Associated Colleges of Illinois. She also lectures at Northwestern University in International and Area Studies. She received her J.D. from The Ohio State University College of Law, Columbus, Ohio and her A.B. with distinction, from the University of Michigan, Ann Arbor, Michigan.